THE 21ST CENTURY SILVER DOLLAR RUSH! A new bull market in silver began in mid-2003, which has driven the price of silver bullion from a low of $4.50 per ounce to a high of over $20 per ounce -- a rise of 250%! Since the new bull market in precious metals began back in 2001, Investment-Grade (MS-65) Morgan Silver Dollars have risen over 165% -- so there's still plenty of room for growth. For over two decades, Swiss America has advised our clients to diversify assets to include precious metals and high quality U.S. gold and silver rare coins for safety, privacy and profit potential. This Swiss America Special Report will examine investment grade Morgan Silver Dollars their amazing history, growing popularity and viability as an investment for tangible asset portfolio diversification and long-term growth. Is this really a new era for silver? Could silver rise to $50, $75 or even $100 per ounce in the years ahead? Which type of silver is best to own? Behind the investment news headlines are some startling facts about why rare U.S. silver (and gold) coins are on track to be among the best assets to own in the 21st century. 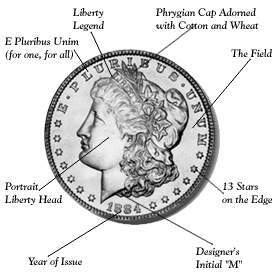 The beautiful Morgan Silver Dollar was sculpted by George T. Morgan and is considered by experts to be the peak of the engravers art. Morgan Silver Dollars were minted between 1878 and 1904. Then in 1921, Morgan Dollars were again minted as an encore and the last year of the series. Gem quality uncirculated Morgan Dollars are sought after by coin collectors, traders and investors alike. Morgan Dollars are second only to Lincoln Cents in collector popularity. 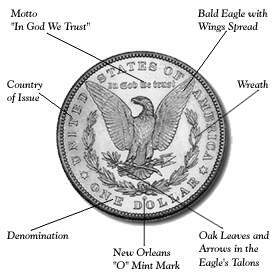 The large size, design and inexpensive nature of most dates of the Morgan Dollar makes them highly popular. The obverse bears the regal head of Liberty and the reverse is a striking design incorporating the majestic American eagle within a wreath. These high relief coins bear Morgan's signature on both sides of each coin, the only regular issue coin in United States history to bear the sculptor's signature on both sides of the coin. Minting of these historic coins began in 1878 with the passage of the Bland-Allison Act. Morgan Dollars were minted by the Philadelphia, San Francisco, New Orleans, Carson City and Denver Mint. Massive meltdowns of Morgan Silver Dollars in the 20th century, together with their growing popularity over the last two generations among both collectors and investors, has drastically reduced the available supply of these coins today -- especially investment-grade specimens. 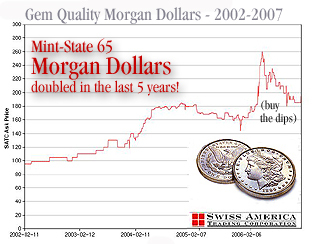 The highest grade Morgan Silver Dollars (MS-64 to MS-68) are considered "investment-grade" coins because prices can be very volatile. PCGS and NGC Certified coins are published weekly on well established coin exchanges. "Sight Seen," or hand-picked coin prices generally exceed the "Sight UNseen" prices in the marketplace, but the fact that the "Sight Unseen" prices are trackable has helped to build investor confidence, market stability and growth over the last two decades. Some Morgan Silver Dollars in pristine, Mint-State condition command very high prices. The finest known pieces often bring hundreds of thousands of dollars at auction. But just because you hear of an 1878-S Morgan selling for $100,000 that doesn't mean your average uncirculated Morgan is worth that, it means that this particular coin is among the "Finest Known" which commands the same respect (and price) as any other fine art piece. There are quite a few rare dates in the Morgan Dollar series. The rarest is the 1895 from the Philadelphia Mint, which was released as a Proof only issue. Most of the early Carson City (CC) dates are worth their premium. Other key dates in high quality include; 1893-S, 1884-S, 1889-CC, 1895-O, 1896-O 1893-O, 1893-CC, 1892-S, 1901. 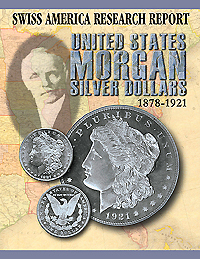 The story surrounding George T. Morgan and the development of the Morgan Silver Dollar is an intriguing one, filled with back-room politics and the clash of titan personalities. Yet it is from this backdrop that Morgan was able to create his crowning achievement. Officials at the Mint in 1876, correctly reading the winds of congressional opinion, anticipated the passage of silver dollar legislation, and therefore authorized a multitude of new silver dollar patterns. 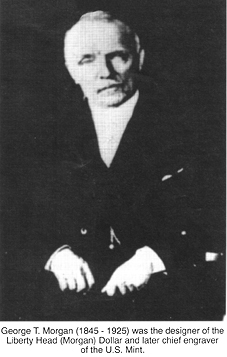 Many were readapted designs of earlier motifs, and it's safe to say that none excited the Director of the Mint, Dr. Henry R. Linderman. To further complicate the situation, the relationship between Dr. Linderman and his Chief Engraver, William Barber, was apparently not a close one. Linderman took the bold initiative of privately seeking an outside engraver, one more receptive to his input and clearly more original in his thinking. It was in this context that Linderman wrote to his friend, Deputy Master C.V. Freemantle of the Royal Mint in London, inquiring if there was a skilled engraver he could recommend. Freemantle's reply was that George Morgan, a young engraver with whom he was acquainted both personally and professionally, might be acceptable. Morgan's credentials were indeed impressive. He had attended several prominent art schools, was a national art scholarship recipient, and studied under the most famous engraver of his day, William Wyon of the British Royal Mint. From Morgan's perspective, the position offered by Linderman represented a grand opportunity, and he was quick to accept. Not long after, negotiations as to the terms of his special appointment were finalized, and on September 27th, 1876 George T, Morgan set sail for America. Immediately upon arrival in Philadelphia, Morgan found himself walking a political tightrope, as he met with various Mint personnel, including Chief Engraver William Barber. Morgan's reception was less than enthusiastic, as he was a perceived threat not only to William Barber as Chief Engraver, but also to his son, Charles Barber, who also worked at the Mint as an engraver and whose future was being carefully cultivated. Unable to prevent Morgans' appointment, Barber was, however, not without considerable clout. Once Morgan was to commence work, Barber was able to forestall his actually working on the Mint premises, ostensibly because of lack of space! Instead, Morgan was forced to set up shop at the boarding house where he was residing! Not surprisingly, the situation proved unsatisfactory and he soon moved to a new location. There he was able to finalize the designs that were to ultimately find their way onto the world's most popular coin, the Morgan silver dollar. 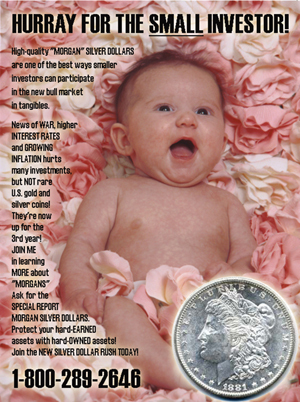 * 2004: BEST MORGAN SILVER DOLLAR MARKET IN 15 YEARS"
* FROM "SILVER" DOLLARS TO "I.O.U. NOTHING" DOLLARS AND BACK! * WHY BUY MORGAN SILVER DOLLARS NOW? REGISTER FOR A FREE COPY OF THE COMPLETE 16-PAGE SPECIAL REPORT! The bull market in precious metals has only just begun, according to a growing number of market analysts. While all investments have risk and past performance is no guarantee of future performance, conservative estimates are that both gold and silver could exceed the previous 1979-1980 market highs of $850/oz. and $50/oz respectively. Call 1-800-289-2646 today to speak with a Swiss America Broker to discuss how and why Morgan Silver Dollars can and should be a part of your portfolio today! DISCLAIMER: All of the provided information is believed to be accurate, however errors are possible. The opinions in the Commentary section do not necessarily reflect the opinions of Swiss America. Past performance of any investment is no guarantee of future performance. All investments have risk. What Does Four-Digit Gold Signal?